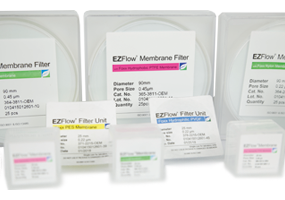 The Membrane Filters from Foxx Life Sciences are produced in two material compositions, PTFE Membrane Filters and Nylon Membrane Filters, to suit your specific process requirements. 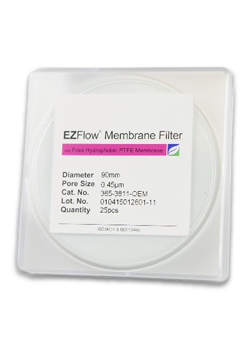 Both membrane filters are available in a variety of sizes, and 0.22µm or 0.45µm pore sizes to suit filtration specifications. All materials comply with USP Class VI Standards and FDA compliances. The Hydrophobic PTFE membrane filter is bonded to a polypropylene support, perfectly constructed for filtration of aggressive solvents, highly acidic solutions or other aggressive chemicals, due to its extreme chemical compatibility. The PTFE Membrane Filters are sold by the pack or by the box. The Nylon membrane filter has great chemical resistance and makes them ideal for filtering more aggressive solutions such as alcohols and DMSO. Nylon is hydrophilic, has low extractables, is high protein binding, and binds proteins DNA & RNA to maximize clarity. The Nylon Membrane Filters are sold by the pack or by the box. 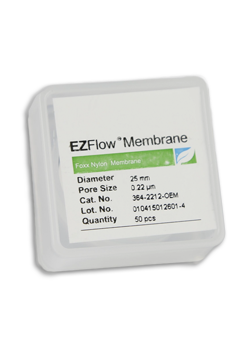 To further discuss the EZFlow Membrane Filters range, and how we can help you. Please contact us, or request a callback at a convenient time to suit you.